I had my first cycle on Saturday after being off the bike for 5.5 weeks with very painful sciatica i.e. intermittently, you get a sharp pain in your side and shooting pains going down your leg – and this can happen during the day or night. Okay, it’s a fairly minor complaint but it’s very annoying and frustrating, particularly with the knowledge that cycling will make it worse. When you look up sciatica on the web, the first thing your told by all the websites I looked at is: There is no cure for sciatica. You just have to wait until it calms down and do warm up and warm down exercises before cycling. So, on the bike – tentatively. When you come back to cycling, especially when you get older, there is a change in the environment. What used to be inclines are back to hills, and what used to be small hills are now biggish hills and as for the big hills – forget about them for a while. However, I know that after a few longer cycle rides, the inclines will return to their former status, as will the little hills and the big hills can be conquered – maybe at a painfully slow rate at first. On Saturday’s bike ride and on today’s, it was refreshing to be out looking at the countryside again, passing clumps of snowdrops now at their peak and also emergent crocus and the odd daffodil in flower. Plus, many of the fields are going green again, while others, newly ploughed, have a sheen on the turned earth which the sun catches. So it was appropriate today that, while on the bike, I listened (safely, able to hear traffic behind me) to a podcast from Melvyn Bragg’s educative and informative series In Our Time on Radio 4. This podcast ( you can listen from anywhere in the world) was on the poet John Clare and there was a fascinating discussion by three academic experts on Clare’s childhood. He was brought up in relative poverty in the village of Helpston in Northamptonshire, where his father worked on a local farm. Clare left school at 11 and was introduced to poetry by fellow farm labourer, who showed Clare a book of poems about landscape. Clare was published in his 20s and was marketed as a poor farm labourer (a la Robert Burns in Scotland) with a gift for poetry. The podcast reveals how Clare became a poet of the countryside – from the countryside’s and its animals’ point of view i.e. Clare on his walks delved into elements such as the Nightingale’s Nest. As one of the panel observed, Clare did not observe the rural landscape “from over a 5-barred gate” as other rural poets did, but included details – such as the composition of the nightingale’s nest. Clare’s fame did not last and he ended up in a lunatic asylum, but he still wrote poems which have endured until today, later in his life. Clare’s style fell out of fashion but there has been a revival of interest in Clare by poets such as Seamus Heaney and Tom Paulin, who admired Clare’s use of local dialect words. I would recommend this podcast to everyone, not just those interested in poetry. We are two-thirds of the way through February and the crocus flowers have added a welcome splash of early Spring colour across the UK. Here in Dunbar, the local council have planted hundreds of crocus around the town. The photos that follow are from the council-planted crop just up the road from my house. It was very windy when I took the photos but the sun was out and the crocus glittered and swayed in the wind, which is not cold today. Tomorrow, however, the temperatures are to plummet and we may get gales and snow, which means a battering for these attractive but flimsy flowers. In this photo, I like the combination of colours, yellow, purple and different shades of green. 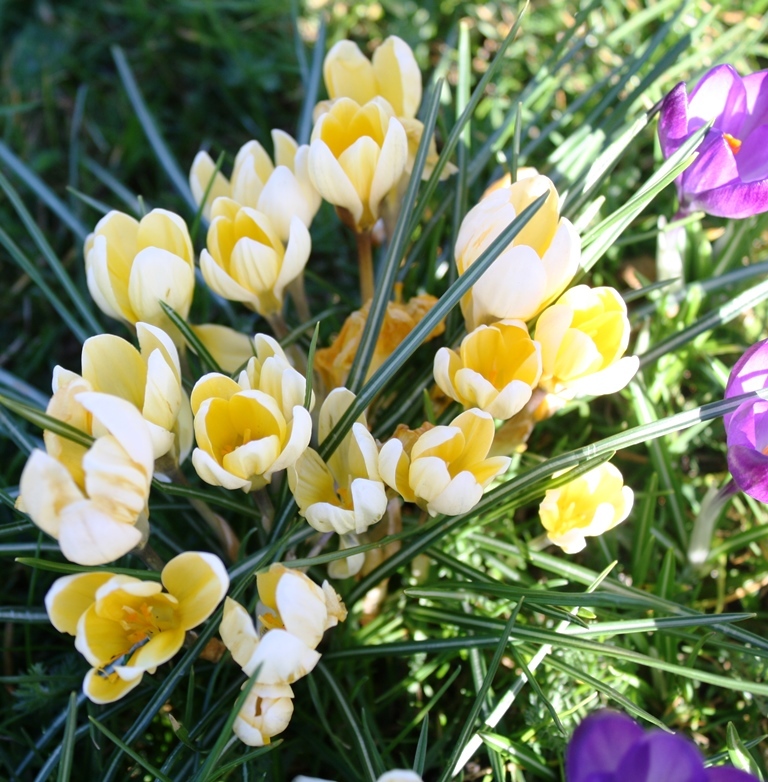 In the next photo, a close-up (difficult to do in the wind), the crocus appear to be reaching up to the sun and opening their flowers to ingest the sun’s rays. 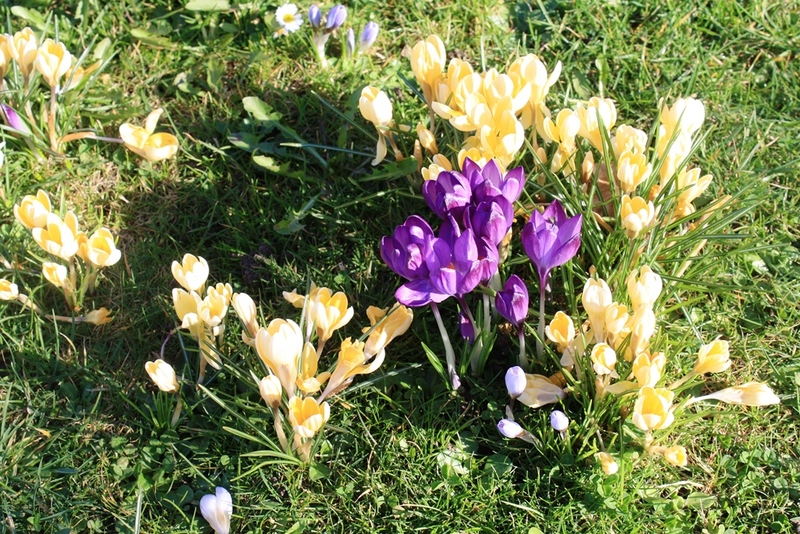 In the final photo, which includes both yellow and purple flowers, the crocus are like open-mouthed choir boys, singing at the top of their voices. 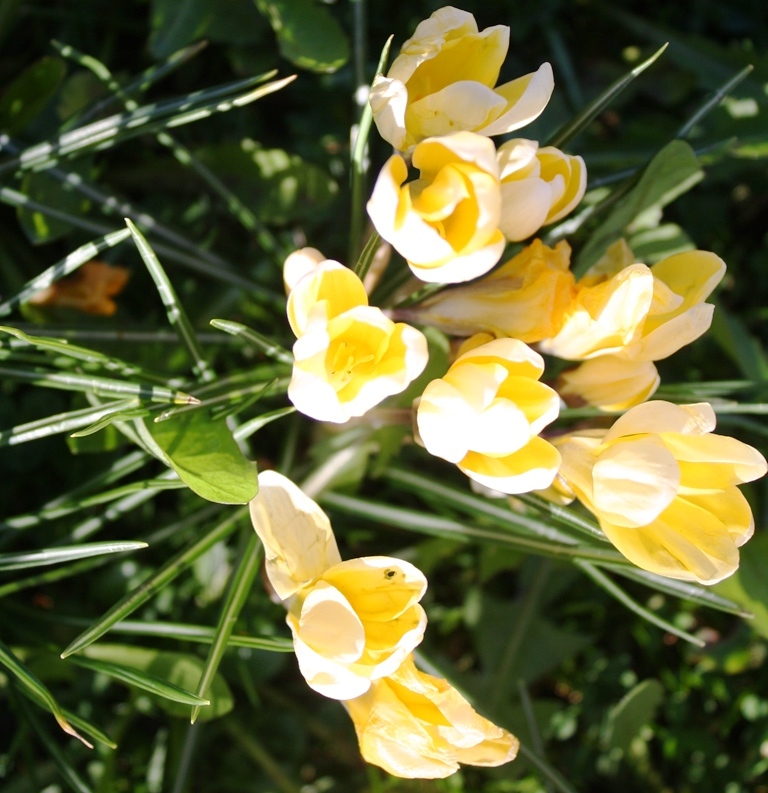 John Clare refers to the crocus in some of his poems, such as this from Early Spring “The Spring is come, and Spring flowers coming too, The crocus, patty kay, the rich hearts’ ease;”. 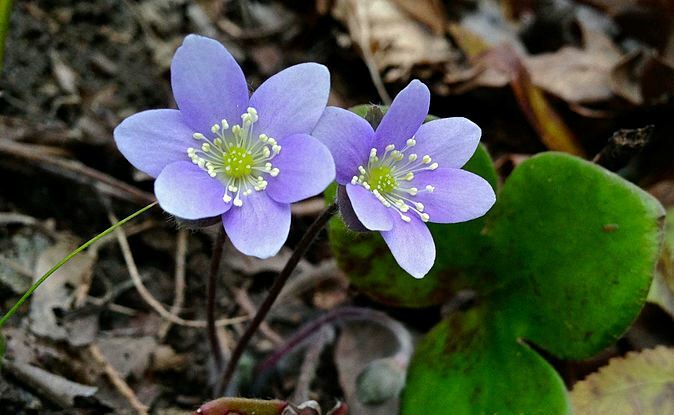 The patty kay is the hepatica flower and the photo below is included under the Creative Commons licence.